iPHONE: the bluetooth smart watch supports Partial Functions including Hands Free,Music Player,Sync Calls,Sedentary Remind,Sleep Monitor,Pedometor,Calculator,Clock,Calender NOT SUPPORT BT Notifications,Sync Message,Remote Notifier,Send Message,Phone Book,Camera, Facebook, Twitter. No Risk, WE OFFER LIFETIME WARRANTY FOR OUR SMART WATCH. IF YOU HAVE ANY QUESTIONS,FEEL FREE TO CONTACT US. ☑【Broad compatibility of Bluetooth Smart Watch】: The android smartwatch compatible with all Bluetooth enabled smartphones. All Android Smartphones, Samsung Galaxy: S8, S8 Plus, S7, S7 Edge, S6, S6 Edge, S5, S4, S3, Samsung Note: 5, 4, 3, 2, SONY, HTC, Huawei, Xiaomi, ZTE, Lenovo, OPPO and other Android phones, Partially Compatible with Apple iPhone 7; Apple iPhone 7 Plus; Apple iPhone 6/6s; Apple iPhone 6/6s Plus;, Apple iPhone 5/5S; Apple iPhone 5C; Apple iPhone 4/4s etc. 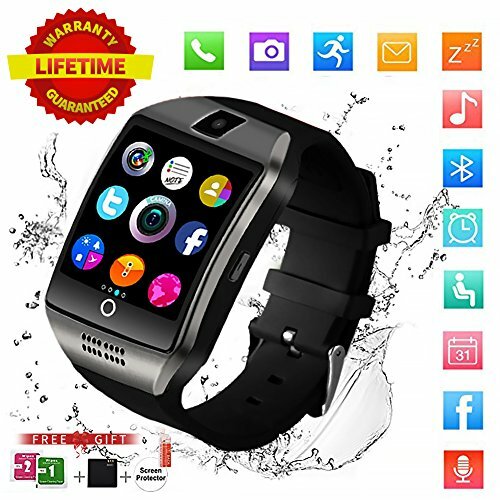 ☑【Bluetooth Smart Watch Wearing More Comfortable】:STAINLESS steel surface, Precision laminating process, Nano TPU85 material strap, anti-sweat matte surface treatment, ergonomic convex design and soft strap which make wearing more comfortable. Life Waterproof, the smartwatch android surface can resist rainwater impact when you are in outdooor. If you have any questions about this product by Newatch, contact us by completing and submitting the form below. If you are looking for a specif part number, please include it with your message.